An employee can be reviewed within a period of 90 days of work. This is the first three months are crucial for every company as the employee is completely new. This form will help analyze the persons work behavior, quality of work etc. to be able to continue working in the same company for a longer duration. This form is for all the employees. It can be used on a yearly basis to know the performance of employees. This is done to compare their work productivity from the previous years so that appropriate actions are taken. Actions may be training or increase in salary as required. The annual employee review forms must be duly filled up and submitted. 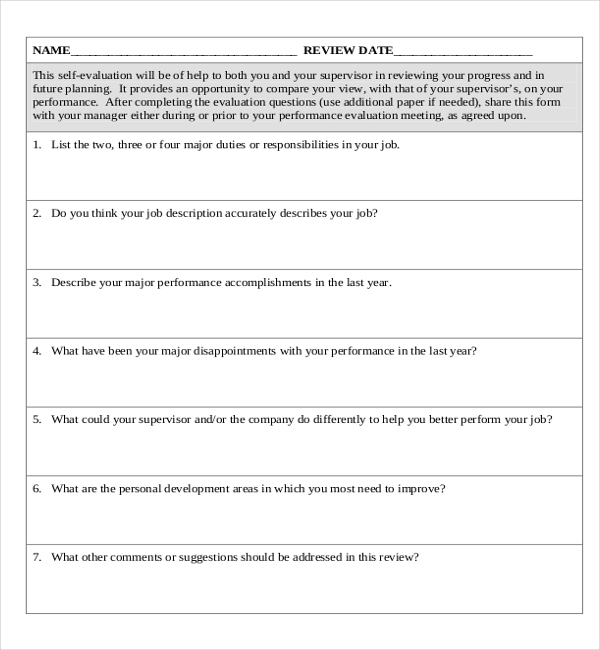 The supervisor uses this basic employee review form to assess an employee’s activity in the workplace. The work ethics and quality of work is noted. Initiation ability, behavior and many other aspects of the employee activity are studied. This form also contains a part where employees assess themselves as well. The form is good for both employees and supervisor. Supervisor need to determine the workers performance by reading the guidelines in the form. A detailed guideline is given for reference so that the reviewer does not go wrong with the rating. 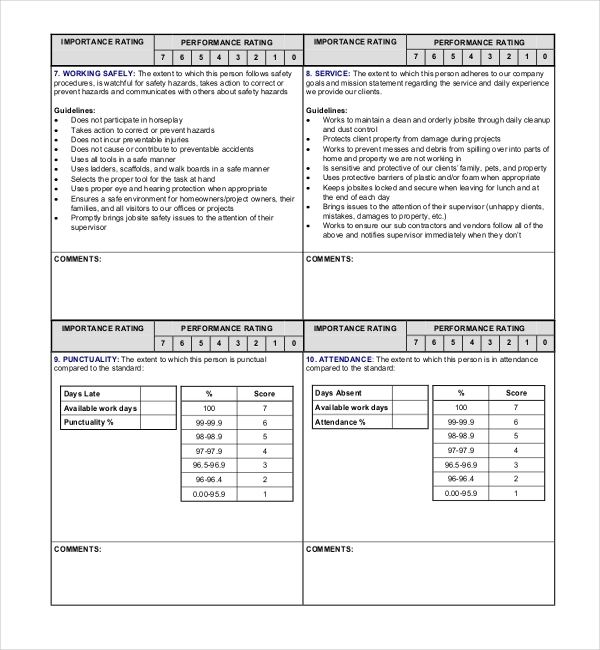 This form contains importance rating and performance ratings, both need to be scored appropriately. The forms can be used every six months for people who are working in a construction sector. 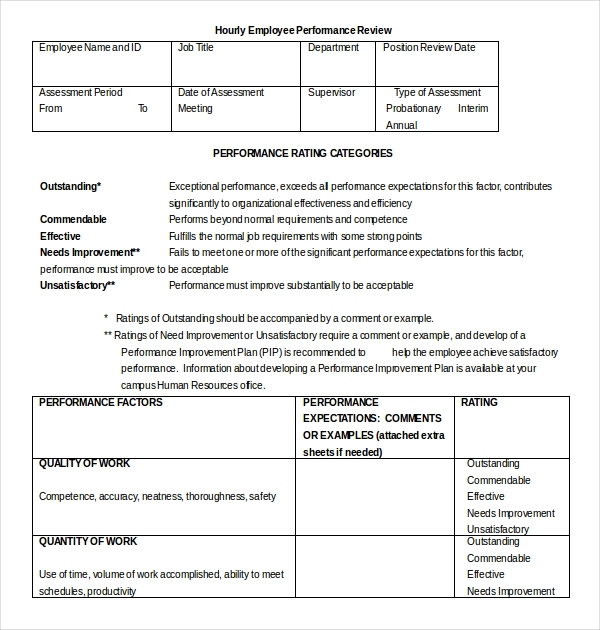 This performance analysis form must show the employees approach to work, his or her creativity, position experience, communication skills, style of work, time taken for work, quality of work, consistency and enthusiasm, attendance, punctuality, creativity and work relations are to be assessed by the reviewer. Generally the rating will differ, because of difference in accountability and skill even if the employees work in the same department of the company. Under this, the behavior, dependency and cooperation are also studied by the reviewer. This form is from the health care centers who want a review about their employees. 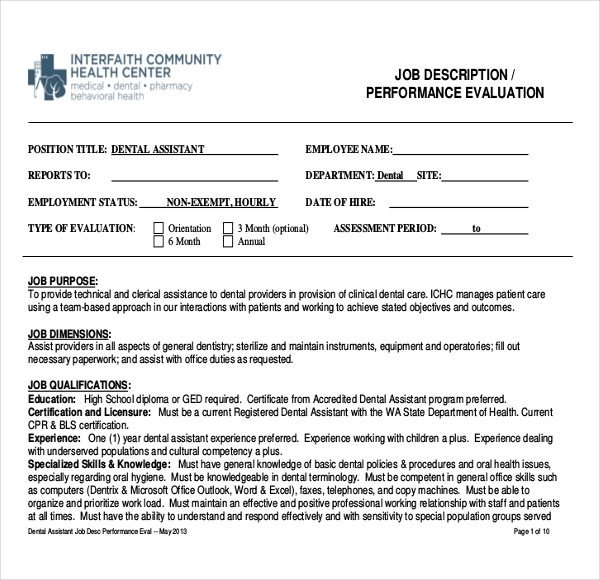 The dental employee form can be used to know the performance of the person with regard to services given to the patient. This review will have questions like patient treatment, patient dismissal, communication, work ethic, time management, team contribution, services given etc. 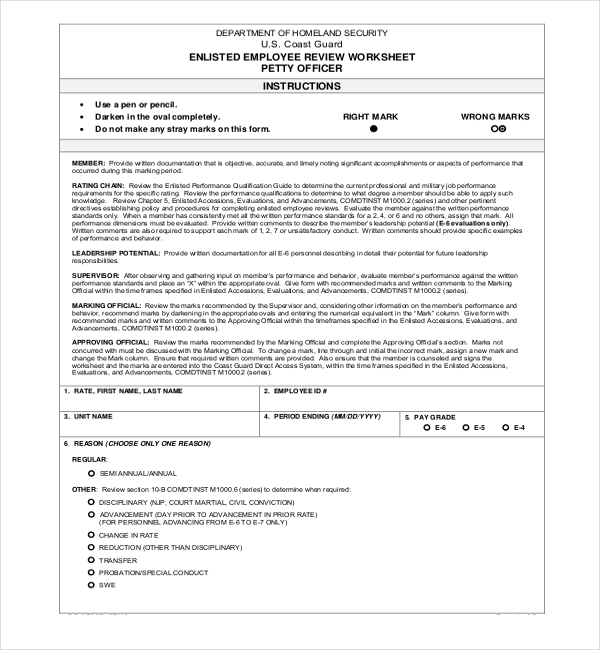 This form is presented by the Department of Homeland Security US Coast Guards. The form contains specifics regarding the employee’s productivity level and other aspects of performance in a workplace. Guidelines on how to mark the asked questions is provided. These must be followed strictly or the form may be rejected. For those who are engineers, this form will be quite useful for the supervisor. They can assess an engineer based on the guidelines in the form. It must be marked carefully. This is done annually so that the performance of the engineer is kept recorded in due time for appropriate actions. The supervisor needs to fill it up with accurate details only. Probationary period is like a trial period of the employee in a company. This can be for 3 months or 6 months since the time he/she joined the company. During this period, the employee is assessed by the supervisor regarding his performance in that particular period. Job title, department, code, date of employment and probation expiry date is needed. 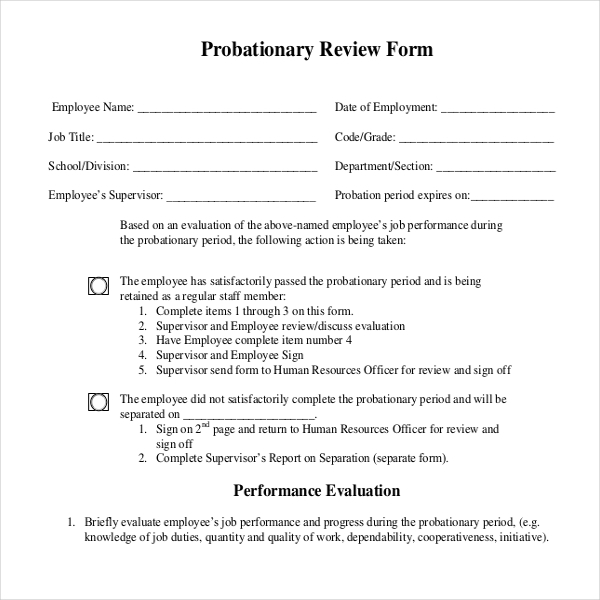 The employees who are needed to be reviewed on an hourly basis would use this form. It is a carefully knit form that can be used to know about the performance of the person. Attendance, relationship at work, communication, achievements, recommendations, performance goals and an overall assessment is determined by the supervisor for the company’s knowledge. An evaluation is best when the reviewer determines an employee’s skill and professional change adaptability on a monthly basis. If the results are not satisfactory, the reviewer must not use them for criticizing the work of the employees. 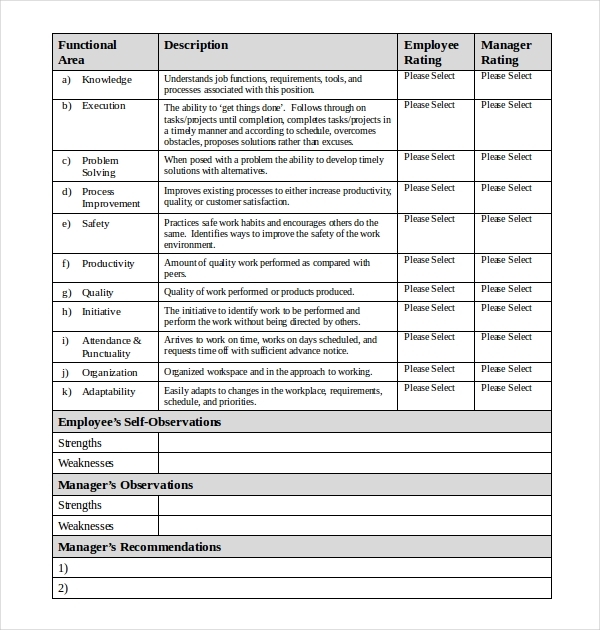 A monthly employee review form has criteria like judgment, cooperation, initiative abilities, work quality, decision making and problem solving skills, knowledge of the job, safety and organizational skills. A university is always concerned in creating a proper working environment amongst faculty and staff. Job performance with the supervisor must be discussed regularly. Hence this form is dealt with the performance goal; it encourages the comments from the staff, students, faculty etc. this form is used in a professional set-up only. 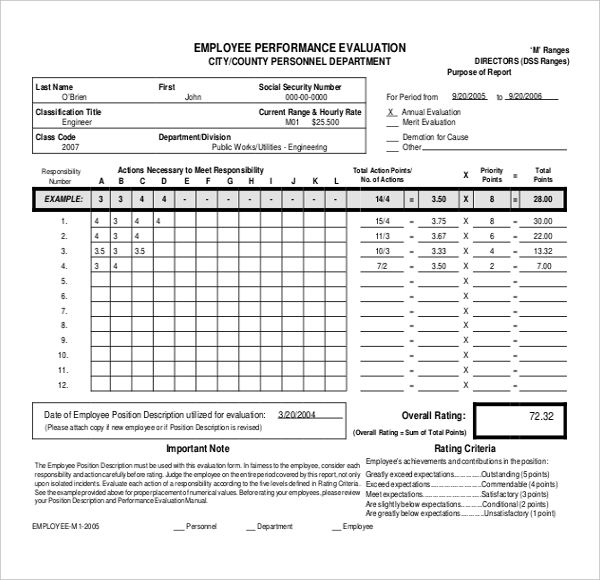 Several companies use the Annual Employee Evaluation Form to study an employee on a periodic basis. Although these annual evaluations of the workers help company CEOs and business executives to evaluate the employee within a period of 12 months, a more frequent review will be more helpful. The strength and weaknesses are viewed by the employee itself and the manager puts their observation and recommendations as required. 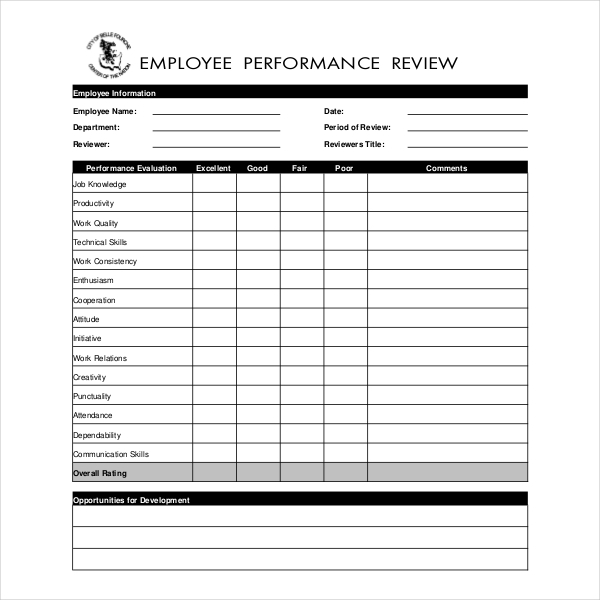 The information through employee review forms are used to enhance an employee’s performance on a monthly or yearly basis and focus more on areas where major attention should be given. This is also used to know the performance of the employee in comparison to last performance. It lets the manager or supervisor take a decision about the employee as needed. These forms can also be used in the court of law to show the employees work as a written proof. Hence, it can act as evidence in the court. The forms are present to help the company grow and to also know whether the employee is worth the pay, whether the resources given to the employee is worth it or not can be known by this evaluation form. These forms are useful for the company and employee as well. Employees come to know the strength and the weakness of their own work. 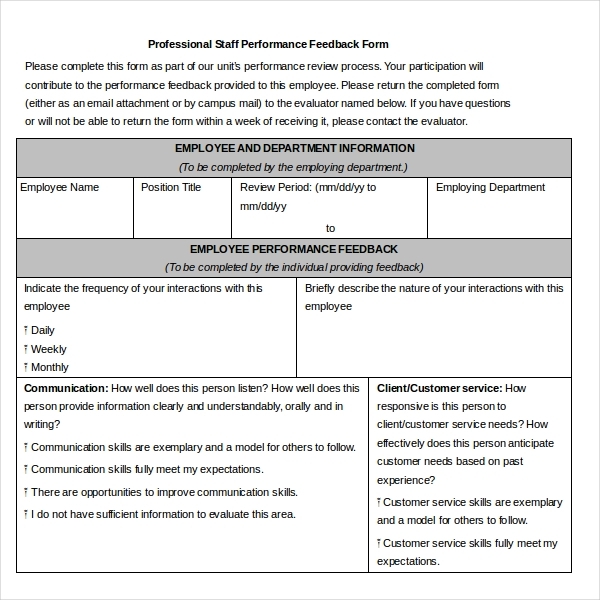 A feedback of the form must be discussed with the employee for better efficiency in the company. These forms must be preserved for future use. Different forms may have different rating scales; hence the evaluation should be done accordingly. The scales must be identified within the norms. Unreal expectations must be prohibited by the supervisors, for example, not straying till late hours every day, or not able to complete excessive number of projects than the norms etc. In such cases, the employee can put up their voice to fight back for their rights. These forms must not be used against the employees for personal rivalries. This is unprofessional. The forms must be used for the betterment of the employee performance instead. The documentation of the reviews is an important step. This is for future use in terms of reference or for any other information. Employees should understand the importance of the forms otherwise it would not be of any use. All the information must be filled up without any bias. Ever wondered how to get such forms? We would make it possible by giving you the Employee review forms through our website. We provide these forms which are easily downloadable and can be printed as well. The sample forms are well tailored and can be used as per your needs. Our website provides these forms that have great compatibility, i.e. they can be got in both lower and higher versions. You can download these forms in both PDF and Word Formats. You should not worry about its quality as these are designed as per the suitability of all the users. The forms can be edited by you, but sill if you need further customization, we would do so comfortably for you. Employee review forms are a necessity in every work set-up. They are commonly used in every company as it is a mandatory step too. Hence, download this form for your benefit. You are just one click away.